Mrs Hartley Brown And Miss Townshend -19th-c Interior Decorators: Who Were They? In a chapter on ‘Decorative Art in England (Travels in South Kensington, 1882) Moncure Conway commended Rhoda and Agnes Garrett for their ‘admirable treatment of the new female colleges connected with English Universities’. 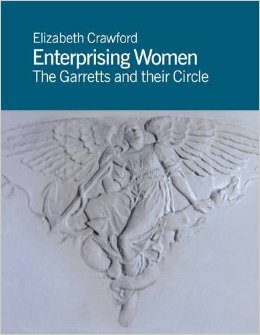 It has always been a niggle that neither I – or anyone else – as far as I know – has ever been able to find any evidence that the Garretts did work on the interior of any women’s college. 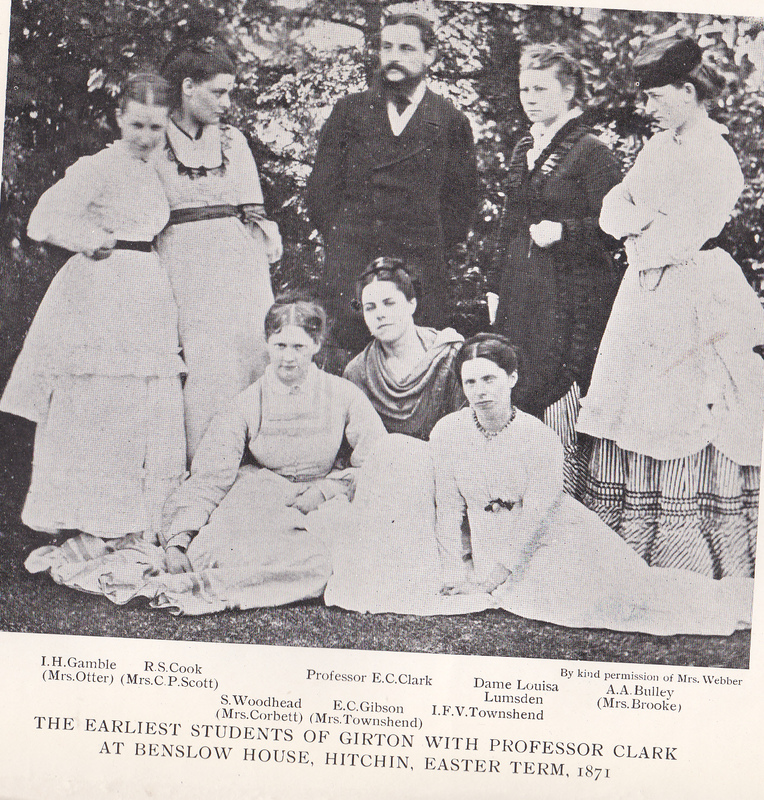 As one member of the Garrett family, Elizabeth, was a close friend and supporter of Emily Davies, founder of Girton, another, Millicent, was a founder of Newnham, and Rhoda and Agnes had received their training in the office of J.M. Brydon, sharing an office with Newnham’s architect, Basil Champneys, it would not have been at all surprising if they had been involved with the interior decoration of one or other of the colleges. But neither in Garrett family letters nor in the press is there any mention of Rhoda and Agnes working on the interior of Newnham – or of Girton. 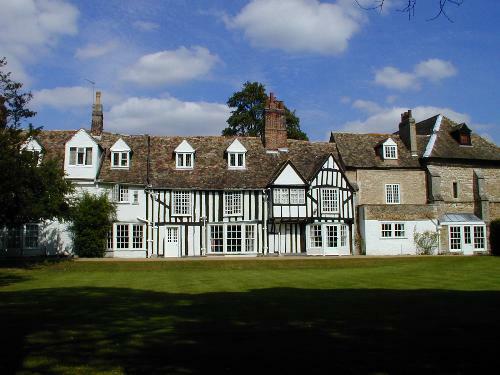 In fact the only mention of work being done by women interior decorators on a Cambridge women’s college relates to furnishings for an early incarnation of Newnham – when, between October 1871 and 1874, it was housed in an ancient, rambling house, Merton Hall. The house belonged (and still belongs) to St John’s College, whose Master was very sympathetic to the Lectures for Ladies’ scheme that had been instigated in Cambridge by Millicent Fawcett, Henry Sidgwick and Jemima Anne Clough. Merton Hall is first mentioned by Moncure Conway in ‘Decorative Art and Architecture in England’, an article published in Harpers New Monthly Magazine, November 1874. In this, after discussing the work of Rhoda and Agnes Garrett, he tells us that Mrs Hartley Brown and Miss Townshend had set up in the same business as the Garretts, in premises at 12 Bulstrode Street. He then goes on to say that ‘These ladies, who have been employed to decorate the new ladies’ College (Merton) at Cambridge, have not only devised new stuffs for chairs, sofas and wall panels, but also for ladies’ dresses.’ The fact that he uses the past tense seems to indicate that the work was already complete. That seems quite clear: Mrs Hartley Brown and Miss Townshend had been involved with furnishing Merton Hall (later Newnham) and neither Conway or Faithfull, although discussing the Garretts’ work, made any mention of the Garrtts being similarly employed. 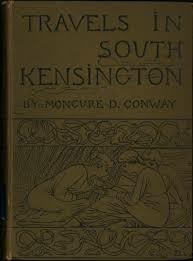 However, when Moncure Conway came to publish Travels in South Kensington in 1882 the Garretts were going from strength to strength and, if the silence in the press is anything to go by, Mrs Hartley Brown and Miss Townshend had gone out of business. One construction might be that, while making no mention of the latter two, Conway lauds the success of the Garretts and, carelessly assigns to them the ‘admirable treatment of female Colleges’. It may be that only one firm of female interior decorators worked on the furnishings of a female college – and that was the partnership of Mrs Hartley Brown and Miss Townshend. But who were Mrs Hartley Brown and Miss Townshend? I have to confess to drawing a blank on Mrs Hartley Brown – but can make an educated guess at the identity of Miss Townshend. Well three can be discounted, being in 1874 already married. Of the remaining five, very little is known of the lives of three, although Alicia, who didn’t marry until 1880, is known to have studied art at the Slade and is I suppose a possibility. However I suspect that the two strongest candidates of the five are Isabella (1847-1882) and Anne (1842-1929). Anne certainly seems to have the most productive work record. According to family information she trained as a nurse at London’s Foundling Hospital and was later Matron at the Hospital for Hip Disease in Childhood (Queen’s Square). When and for how long she was engaged in nursing I don’t know. By 1882 she had moved into philanthropic administration and was secretary of the Metropolitan Association for Befriending Young Servants (MABYs). Then in 1888 she became the first secretary of the Ladies’ Residential Chambers Co (the founders of which included Agnes Garrett and Millicent Fawcett) and remained involved with the company until 1910. In 1890, when the company was planning a new set of chambers in York Street, Marylebone, it was Anne Townshend who was deputed to consult with Thackeray Turner, the architect, over the company’s specifications for the new building. However nowhere in the minutes of the Ladies’ Residential Co is there any suggestion that she was ever involved with the interior design of either of the buildings. Isabella Townshend is the more artistic candidate – and she does have a very clear Cambridge connection- being one of the Girton Pioneers. 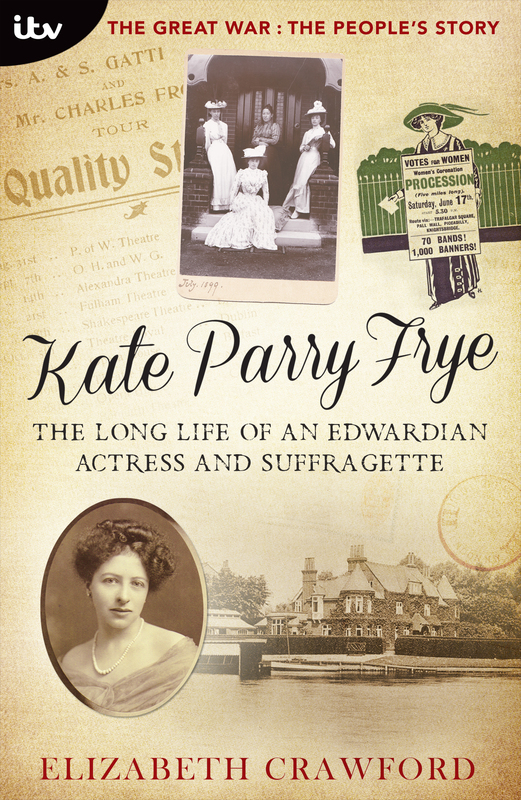 In 1869 she was one of the first five to join Emily Davies at her new college at Hitchin (it was not yet ‘Girton’). She left without taking a Tripos at Easter 1872. Could she then have gone into the interior decorating business? However, Isabella certainly made a very strong impression on her fellow Pioneers – particularly on Emily Gibson. When Isabella left Hitchin in the 1872 without taking a Tripos (perhaps it was this high-handed approach to all that Miss Davies had to offer that attracted Barbara Stephen’s disapproval) Emily followed suit and the following year married Isabella’s brother, Chambray Townshend. Isabella Townshend was undoubtedly ‘artistic’. Isn’t this a wonderful self-portrait – bequeathed to Girton by Emily Townshend? It wouldn’t at all surprise me if Isabella had not ‘devised new stuff’ for her dress and designed it herself. But did she have the stamina to set up in business? 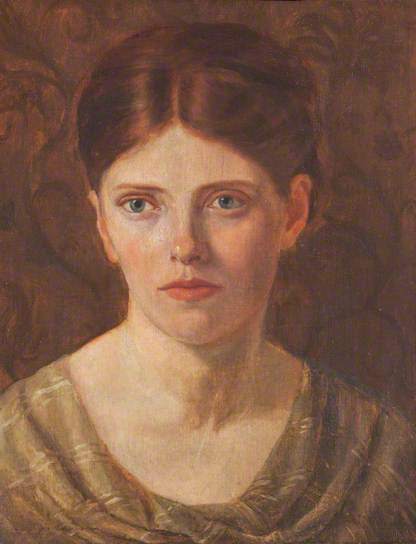 Emily Gibson mentions that in the period between leaving Cambridge and her marriage to Chambray Townshend, he and Isabella were particularly friendly with Walter and Lucy Crane – so she was certainly moving in art design circles. The house may well have been the Townshend family home at 12 Ridgway Place, Wimbledon, where the unmarried sisters lived with their mother. Unfortunately Chambray Townshend took the same laissez-faire approach to work as did Isabella. Of him Emily, his wife, later wrote ‘Chambrey Townshend had little push and no business ability to back up his remarkable artistic abilities.’ After his death she regretted she hadn’t devised some opening for his remarkable talent for house decoration ‘when architectural work was not forthcoming’. If the interior decoration business was run by Mrs Hartley Brown and Isabella Townshend, it may be that Isabella soon lost interest. In the early 1880s she went to Italy to study painting and died in 1882. The Girton Register has it that she died in Italy, ‘of typhoid fever contracted at Capri’. It may well be that she became ill in Italy, but the Probate Register shows that she died on 20 July 1882 at Ealing and was buried at Perivale on 25 July 1882. So, although Anne Townsend had the stamina and application to run a business, I’m inclined to think that it was Isabella Townshend who, for a brief period, was in partnership as an interior decorator with Mrs Hartley Brown and who provided the furnishings for Merton Hall, the early incarnation of Newnham. For more about the interior decoration business run by Rhoda and Agnes Garrett see here. This entry was posted on February 27, 2015, 4:10 pm and is filed under The Garretts and their Circle. You can follow any responses to this entry through RSS 2.0. You can leave a response, or trackback from your own site.